THE Wisconsin primary election law, defective as it has been, has perhaps been more examined, criticised and discussed than any other of its kind. The reason for the primary is obvious. The pressure brought to bear on conventions by the great economic forces which dominated this country aroused public sentiment and made it necessary to have more direct means of nomination. Whatever may be the defects of the direct nomination of candidates, it must be said that with organized and vigilant monopolistic power in existence, a system, by which a few men gathered together to select others who, in turn, selected others as candidates, was so complicated and presented so many opportunities for influence or corruption that it had to go. As a business device it would go wrong, as there was absolutely no way of fixing responsibility. The uneasiness felt by the people because those who determined its policies did not represent the real sentiment, had to be pacified in some way. It was felt that the primary was the means for combating the secret intrigue which skilled corporation employees could sustain in a caucus and convention system. From this point of view it was absolutely necessary and fundamental if any plan for the efficient control of the great dominating influences could be carried out. The law was unfortunate in its passage. Several bills were discussed all of which were more or less defective. Finally without due amendment and discussion as to details, the enemies of the bill agreed suddenly to let one of these bills be submitted to the people. For several years it was practically impossible to amend it in the slightest degree. Any proposition to amend it was at once defeated with the explanation: this law has been passed by the people; let us wait and see how it works before we amend it. Therefore it had defects which were very serious ones. However it has since been amended and seems destined to remain on the Wisconsin statute books. There are those who believe that some of the state officers should not be included in the primary law. Without a short ballot, it is difficult to judge of the fitness of a secretary of state, a state treasurer or an attorney-general. Fortunately there are very few such officers in this state, but in the opinion of many who have studied the question well, in those states which have a multiplicity of elective state officers there may be further justification for the above criticism. The remedy may be in the short ballot principle. In the opinion of the writer, the offices of secretary of state, state treasurer and attorney-general should be appointive. The position of insurance commissioner was made appointive in Wisconsin in 1911. There is no question but that the primary election law should have been followed at once by a corrupt practices act limiting in some way the amount of money to be spent, but it was impossible to enact such a law at the time the primary law was passed. The primary has sometimes proven too costly because of this grave omission, but the fault lies not with the friends of the primary as they soon saw its defects and session after session tried to remedy them. It is evident that the Wisconsin legislature is, on the whole, improving from year to year. There are not as many brilliant leaders as formerly but neither are there as many stupid or corrupt men. The primary seems to elect a middle class average man of independence and intelligence. The old system tended to elect either brilliant, well-known men or those who were merely pawns in the game. Under the primary, individuals announce their intention of becoming candidates and fearlessly run for office. Legislators have often admitted to the writer that they would not attempt to run for office under the old system. No one has to ask for that privilege now. Bagehot, in his "History of the British Constitution," somewhere says that the best government is that in which there is a limited number of real aggressive leaders and a great many who are willing to be led. He points to England as a country of this type. The writer does not agree with that philosophy, but nevertheless he must admit that because of the new primary law, there is sometimes so much individualism in the Wisconsin legislature that it is difficult to promote business rapidly. There have been occasions when to some extent a lack of unison was evident. Business is not despatched as smoothly as formerly because you have to "show" every man. Each individual member wants to know about it and talk it over and he is unwilling to accept such leadership as was prevalent under the old system. The boss is not welcome now. There is more debate and more discussion but the writer considers this an exceedingly healthy symptom, for the results indicate more real intelligence in legislation. Although the law is long and involved, it can be summarized in a very few words; the peculiar features of it require a longer description. The most noteworthy feature of the primary election law is that it is an absolutely direct election, compulsory and state wide. It was intended to abolish the caucus and it does. There is no caucus and there is no voting for delegates of any kind, except delegates to the national convention. Chapter 451, laws of 1903, provides for absolute secrecy and a thoroughgoing secret ballot incorporated into the primary election law. It is what is called the open primary, that is, there is no test of party affiliation. This latter feature is still under fire and has been subjected to great criticism, but the chances are that any attempt to repeal it would be defeated by at least 4 to 1 in the state. Those who favor it justify their attitude on the basis that although one party may go into another party's primary and nominate its weak man, it more often happens that the independent voter will cast his vote for the person whom he considers to be right, no matter to what party he belongs. The reform and not the party seems to be the main issue in Wisconsin, and there are those who vigorously state that the badge of party loyalty has too long been a mask used in defeating the manifest will of the people. The non-partisan spirit generally prevalent in Wisconsin helps the position of those who are adherents of the open primary and aids the accomplishment of the whole program of direct legislation. The law applies to all elective offices, except the judges, the state superintendent of public instruction and some minor offices in towns, villages, school districts, etc. It is not generally used in small cities because it is not very practical, although it may be applied to all cities. The exemption of judges and educational officers is characteristic of the Wisconsin non-partisan spirit. Finally, delegates to the national convention are elected by the primary and provision is made for a statement of presidential preference. The act also contains a provision for second choice which it is hoped will tend to produce a majority or at least something approximating a majority. This law was passed in 1911 after a hard struggle which started the moment the first bill was introduced. Its peculiar features and the philosophy behind it, need some extended discussion, as its great importance has not been fully appreciated throughout the country. The second choice law (chapter 200, laws of 1911) is a modification of the system used in Queensland as far back as 1887. No better argument in favor of this innovation can be given than that used by Mr. Charles K. Lush, a brilliant newspaper man and author, who has given permission to use excerpts from his pamphlet "An essential amendment to the primary law." As this pamphlet is now out of print and the discussion is so exceedingly valuable many extracts from it have been used. It must be remembered in reading it that it was written before the second choice law was passed. However, it is an explanation of what was actually later enacted into law. "It is the principle that the nominee of a political party should represent the party principles or policy of the majority of the voters of the party. It prevents the possibility of a man representing the principles of only one-fourth of the voting strength of the party being nominated as the candidate of the party, and in direct conflict with the views of three-fourths of the voters of the party. It was the recognition of this principle that caused the conventions to nominate by majority vote of the delegates instead of by plurality. The present Wisconsin primary law prevents a number of candidates representing the majority sentiment as to party principles from coming into the field as candidates for the nomination for fear the candidate of a minority may be named by receiving a higher vote than any one candidate among the majority candidates. The present primary is, in effect, a convention to which every voter is a delegate and in which the candidate receiving the most votes on the first ballot is the nominee. The remedy lies either in the adoption of the second choice amendment . . . or by return to the convention system. "An effort has been made to make it appear that the second choice system is very complicated. The voter casts one vote for a candidate as his first choice and another for the man whom he would like to see nominated if his first choice cannot be nominated. So far as the voter is concerned there is no complication. "Delegates who attend state conventions do not find it complicated to vote for their second choice after they find that their first choice cannot be nominated. "A diagram of the tally sheet, and of the checking and computing blank will make the second choice proposition clear. "It will be seen by studying the above table that Brown made no gain on the final 'ballot' for the reason that none of the 25 voters who voted for Adams for first choice voted for Brown for second choice. Ten of them, however, voted for White as their second choice, while 15 of them voted for Black as their second choice. These 15 second choice votes are not counted for the reason that they were being counted for Adams while he was still in the race, and, before Adams was out of the race, Black was out of it. These voters simply voted for two losers. This explains why, in the above showing between Brown and White their total vote is only 145, while there were 160 votes cast in all. But 15 of these votes were cast for Adams and Black, both of whom were low men--two losers. "This system does not always insure a majority of all votes cast but it does insure the nomination of a candidate who represents the majority sentiment of the party as regards party principles. Let us illustrate by showing what can happen under the present law, where a first choice alone counts and the high man is nominated, all of the rest being 'eliminated.' To begin with, remember that the present primary is, in effect, a party convention to which all party voters are delegates entitled to one vote on the only 'roll call' allowed. The man who receives the highest vote on this 'first ballot' (the primary vote) is the nominee of the party. "By this result, which is the present system of the highest candidate being the nominee, the stand-pat republican would become the nominee of the 7000 voters absolutely opposed to the policy advocated by him. Could anything be more absurd than this? "Now let us use this same case and apply the second choice rule by which the lowest candidate is 'eliminated' and not all but the highest 'eliminated' which is the present primary law. "The first count of first choice votes would be as above given. "B would accordingly be the candidate representing the views of 7000 voters, instead of A representing the tariff policy of only 3000 voters." "This boss, be his leadership for good or for evil, has the power to place candidates early in the field, and then warn other men not to become candidates on the unassailable ground that a number of candidates of the majority faction might split the vote and allow the solitary candidate of the minority to be chosen as the party nominee. By thus naming the candidate of the majority faction of the dominant party the boss is 'all potential.' " Under the second choice law he holds that "the leader of the majority faction would have had no such power, for several men of known loyalty to the principles of the majority faction could be candidates, secure in the knowledge that those who voted for them as a first choice would give their second choice to some candidate representing the same principles and advocating the same line of legislation, thus precluding the nomination of the minority candidate. The boss or leader might still properly give his support to some one of the candidates, but it would be plainly a matter of personal preference, and not justified on the ground of safeguarding the rights of the majority to name the candidate of the party." "It is necessary that the 'boss,' or leader, should 'eliminate' the candidates of the majority before the primaries are held, otherwise the candidate of the minority would be the nominee of the party. Under the second choice feature . . . the voters do this 'eliminating' at the primaries. Until this opportunity of selection is placed in the hands of the people there can be no true representative government." No election has yet been held under the law. Its opponents have shown many diagrams to the effect that it will produce quite the opposite effect from that intended. In a newspaper election held by a Milwaukee paper the voters seemed loathe to use the second choice at all. The opponents of the law claim that it cannot be understood by the average voter, that it will cause all kinds of mistakes and will require a long time to tabulate results. Its supporters admit this last contention but maintain that it is not serious and that the tally sheets inserted in the law will make it easily and correctly counted by men of fair intelligence. There was added to the primary at the 1911 session, a presidential preference law (chapter 300 laws of 1911). "Section 11-26. Names of candidates for president and vice-president may be placed on ballot. 6. For the purpose of enabling every voter to express his choice for the nomination of candidates for president and vice-president of the United States, whenever there shall be filed with the secretary of state a petition as provided by section 30 of the statutes, the names of such candidates shall be certified to the county clerks, and shall be printed upon the official party ticket used at said election. No signature, statement, or consent shall be required to be filed by any such candidate." Before the law of 1911 was passed, Wisconsin had no limitation on corrupt practices except stringent laws as to bribery and contribution of campaign funds by corporations. It cannot be said however, that it was not without defences from corruption. From the moment the publicity features of the railroad commission and public utility acts went into effect, a greater caution became necessary in the expenditure of large sums influencing the elections. Corrupt practice acts have been passed in many states and have long been in force in England. There are some things however, in the Wisconsin act deserving special attention. The act is remarkable, not only for its restrictive feature--that feature is found in many acts--but for its relation to other Wisconsin legislation. It was constructed not only with the thought of restricting the use of money but also with the idea, so often used in Wisconsin acts, of insuring equality of opportunity. Taking the Oregon scheme of using a pamphlet to get the candidates' platforms before the public as a basis, it has developed a law with a certain philosophy underlying it. That philosophy may be outlined as follows: there should be equality of opportunity in running for or in holding office; if this is denied, there arises a governing class able to control election to office through money expended, and there remains a large class which is seldom represented among candidates for office. It is the duty of the state, therefore, to equalize these conditions by not only restricting the amount of money which can be spent by the man of wealth but also to equalize conditions still further by putting means into the hands of the poorer man, whereby his ideas may be placed before the whole people. "The use of money as a factor, in determining the qualifications of a man to hold a public office, is fundamentally wrong. "It is necessary for each voter to have sufficient information, in order for him to determine intelligently to whom his support shall be given. "How shall this information be furnished? "Each voter should know who the candidate is, for what principles he stands, and what his record has been. "This information should be furnished and placed in the hands of each voter at public expense. "The reason for this is that our government is not based upon property qualifications for voting or holding office. It is based upon manhood suffrage; equality before the law; equality in opportunity; equality in voting power. The elector is selecting a public servant to perform public duties, and if the elector makes a mistake in this selection, he must bear the burden. It is a public duty he is performing, and the entire commonwealth is interested in having each elector receive sufficient information to perform that duty intelligently and well. "The qualifications of two men being equal, the power of one with a large amount of money to spend, should be no greater, in securing votes, than the one without money. The amount of money the one has to spend does not add one iota to his qualifications to hold that office. "Wherein lies the power of the man with money? He can bribe. He can influence votes with money. He can buy newspapers. He can indirectly buy the editorial columns of newspapers for the campaign. He can hire a large number of people to work for him, which implies that they will vote for him for the same consideration. He can prevent others from being candidates for the same office. He can hire others to become candidates in aid of his candidacy. He can make himself feared and dreaded by the force of power his money gives him. He can practically purchase the office. "He does not aid the elector in any manner in determining the qualifications of the candidates; his purpose is the opposite. "The state is interested in securing the services of the man who is best qualified to hold the office, not the man who alone has the most money. "If the best qualified man is poor and unable to place in the hands of the voters the necessary information, he cannot be a candidate, and hence the state is deprived of his services. "How can this be remedied? "First, Deprive the rich man of some of his powers; do away with his property qualifications as far as possible; make him stand on his real qualifications for the office. "Second, Let the state aid the man who has no money to assert the power he should have to give him equality in opportunity. "In other words, let the state regulate the power of the rich man, by depriving him of the right to use his money in securing office, and aid the poor man so as to place them as nearly as possible on an equality. . . .
"The law should name the particular purposes for which any money can be used, such as personal travelling expenses, postage for personal letters; and prohibit all uses of money for any other purpose. "Further limit the entire amount so it shall not exceed, under any circumstances, twenty-five per cent of one year's salary of the office for which the person is a candidate. "This will tend to give all an equal opportunity. It will, at least, enlarge the class from which the public servants may be selected, and not limit it to persons of very large wealth only." "(1) For his own personal hotel and travelling expenses and for postage, telegraph and telephone expenses. "(2) For payments which he may make to the state pursuant to law. "(3) For contributions to his duly registered personal campaign committee. "(4) For contributions to his party committee. "(5) For the purposes enumerated in section 94-7 of the statutes, when such candidate has no personal campaign committee but not otherwise. "2. 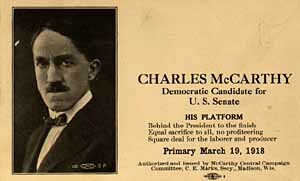 After the primary, no candidate for election to the United States senate shall make any disbursement in behalf of his candidacy, except contributions to his party committees, for his own actually necessary personal travelling expenses, and for postage, telephone and telegraph expenses, and for payments which he may make to the state pursuant to law (1911 c. 650). "(1) For maintenance of headquarters and for hall rentals, incident to the holding of public meetings. "(2) For necessary stationery, postage and clerical assistance to be employed for the candidate at his headquarters or at the headquarters of the personal campaign committee, incident to the writing, addressing and mailing of letters and campaign literature. "(3) For necessary expenses, incident to the furnishing and printing of badges, banners and other insignia, to the printing and posting of handbills, posters, lithographs, and other campaign literature, and the distribution thereof through the mails or otherwise. "(4) For campaign advertising in newspapers, periodicals or magazines, as provided in this act. "(5) For wages and actual necessary personal expenses of public speakers. "(6) For travelling expenses of members of party committees or personal campaign committees (1911 c. 650)." "(1) For United States senator, seven thousand five hundred dollars. "(2) For representative in congress, two thousand five hundred dollars. "(3) For governor, judge of the supreme court or state superintendent of schools, five thousand dollars. "(4) For other state officers, two thousand dollars. "(5) For state senator, four hundred dollars. "(6) For member of assembly, one hundred fifty dollars. "(7) For presidential elector at large, five hundred dollars, and for presidential elector for any congressional district, one hundred dollars. "(8) For any county, city, village or town officer, for any judge or for any officer not hereinbefore mentioned, who, if nominated and elected, would receive a salary, a sum not exceeding one-third of the salary to which such person would, if elected, be entitled during the first year of his incumbency of such office. If such person, when nominated and elected, would not receive a salary, a sum not exceeding one-third of the compensation which his predecessor received during the first year of such predecessor's incumbency. If such officer, when nominated and elected, would not receive a salary and if such officer had no predecessor, and in all cases not specifically provided for, twenty-five dollars and no more." The most daring and experimental feature of the whole law, which has found no place elsewhere, is the procedure for prosecutions of offenders. This is again based upon a concept already familiar to readers of this book. It strives to give the man who has no money a chance to stand in the court against a wealthy and corrupt man. In arriving at this procedure every kind of device was used to constitute some tribunal outside the courts to care for these cases. The attempts made by other states to establish a special tribunal for such cases have either been declared unconstitutional or would clearly be so under the Wisconsin constitution. Comparatively few prosecutions have taken place under corrupt practice acts in this country and there are few practical laws which give equality in the long litigation of such cases. This procedure is an honest attempt to provide for prosecution quickly and effectively. There are those who doubt the wisdom of it and believe that this law has gone too far in this direction. It provides for investigation in a rudimentary way, suggestive of the investigations authorized by any of the regulative laws of this state. It specifies also that the state may supply special counsel so that the state and not the aggrieved individual says to the person who is in apparent error, "We are going to investigate this. If we find sufficient cause we are going to prosecute you however many times you may appeal and however far it may be necessary to go in order to punish you and purify our elections." The procedure is appended at some length because of its original character and experimental nature. The leaders are seeking and inviting criticisms of it. "Prosecutions, proceedings by electors. Section 94-30. 1. If any elector of the state shall have within his possession information that any provision of sections 94-1 to 94-38, inclusive, of the statutes, has been violated by any candidate for which such elector had the right to vote, or by any personal campaign committee of such candidate, or any member thereof, he may, by verified petition apply to the county judge of the county in which such violation has occurred, to the attorney-general of the state, or to the governor of the state, for leave to bring a special proceeding to investigate and determine whether or not there has been such violation by such candidate or by such committee or member thereof, and for appointment of special counsel to conduct such proceeding in behalf of the state. "Leave to bring action. 2. If it shall appear from such petition or otherwise that such candidate, committee or member thereof has violated any provision of this act, and that sufficient evidence is obtainable to show that there is probable cause to believe that such proceeding may be successfully maintained, then such judge or attorney-general or governor, as the case may be, shall grant leave to bring such proceeding and shall appoint special counsel to conduct such proceeding. "Special proceedings. 3. If such leave be granted and such counsel appointed such elector may, by a special proceeding brought in the circuit court in the name of the state, upon the relation of such elector, investigate and determine whether or not such candidate, committee or member thereof, has violated any provision of this act, but nothing contained in this act shall be considered as in any way limiting the effect or preventing the operation of remedies now in existence in such cases. "Summons and complaint; service. Section 94-31. 1. In such proceeding the complaint shall be served with the summons, and shall set forth the name of the person whose election is contested, and the grounds of the contest in detail, and shall not thereafter be amended except by leave of the court. The summons and complaint in the proceeding shall be filed within five days after service thereof. "Answer. 2. The answer to the complaint shall be served and filed within ten days after the service of the summons and complaint. Any allegation of new matter in the answer shall be deemed controverted by the adverse party without reply, and thereupon said proceeding shall be at issue and stand ready for trial upon five days' notice of trial. "Trial; precedence; without jury. 3. All such proceedings shall have precedence over any civil cause of a different nature pending in such court, and the court shall always be deemed open for the trial thereof, in or out of term, and the same shall be tried and determined the same as are civil actions, but the court shall without a jury determine all issues of fact as well as issues of law. "Consolidation of proceedings. 4. If more than one proceeding is pending or the election of more than one person is investigated and contested, the court may, in its discretion, order the proceedings consolidated and heard together and may equitably apportion costs and disbursements. "Depositions. 5. The parties to such proceedings may invoke the provisions of sections 4068 and 4096 of the statutes, but two days' notice of the taking of the deposition of any witness shall be sufficient notice thereof. "Change of venue. 6. In all such proceedings either party shall have the right of change of venue, as provided by law in civil actions, but application for such change must be made within five days after service of summons and complaint, and the order for such change shall be made within three days after the making of such application and the papers transmitted forthwith, and any neglect of the moving party to procure such transmission within such time shall be a waiver of his right to such change of venue. "Judgment: costs. 7. If judgment is in favor of the plaintiff the relator may recover his taxable costs and disbursements against the person whose right to the office is contested, but no judgment for costs shall be awarded against the relator, unless it shall appear that such proceeding has been instituted otherwise than in good faith. All costs and disbursements in such cases shall be in the discretion of the court. "Judgment of ouster; disqualification; filing vacancy. Section 94-32. 1. If the court shall find that the candidate whose right to any office is being investigated, or his personal campaign committee or any member thereof has violated any provision of this act, in the conduct of the campaign for nomination or election, and if such candidate is not one mentioned in subsection 2 hereof, judgment shall be entered declaring void the election of such candidate to the office for which he was a candidate, and ousting and excluding him from such office and declaring the office vacant. The vacancy thus created shall be filled in the manner provided by law, but no person found to have violated any provision of this act shall be eligible to fill any office or to become a candidate for any office, candidates for which have been voted for at the primary or election in connection with which such violation occurred. "Congressional and legislative offices; proceedings. 2. If such proceeding has been brought to investigate the right of a candidate for member of the state senate or state assembly or for senator or representative in congress, and the court shall find that such candidate or any member of his personal campaign committee has violated any provision of this act, in the conduct of the campaign for nomination or election, the court shall draw its findings to such effect and shall forthwith, without final adjudication, certify his findings to the secretary of state, to be by him transmitted to the presiding officer of the legislative body, as a member of which such person is a candidate. "Appeals; stay of proceedings; injunction. 3. Appeals may be taken from the determination of the court in such proceeding in the same manner as appeals may be taken as provided by law in civil actions, but the party appealing shall in no case be entitled to or obtain a stay of proceedings. No injunction shall issue in any such proceeding suspending or staying any procedure therein or connected therewith, except upon application to the court or the presiding judge thereof, upon notice to all parties and after hearing. "No bar to criminal prosecution. 4. No judgment entered as provided for herein shall be any bar to or affect in any way any criminal prosecution of any candidate or other person. "Special counsel; supreme court. Section 94-33. 1. If the judgment of the trial court is appealed from in such proceeding, the county judge, the attorney-general or the governor, who made the appointment of special counsel for the trial court, shall authorize such counsel so appointed, or some other person to appear as special counsel in the supreme court in such matter. "Compensation. 2. The special counsel provided for by this act shall receive a reasonable compensation for his services, not to exceed, however, twenty-five dollars per day for the time actually spent in conducting the proceedings in the trial court or upon appeal, and not to exceed ten dollars per day for the time necessarily expended in preparation therefor. Such compensation shall be audited by the secretary of state, and paid out of the state treasury upon a voucher and upon the certificate of the officer appointing such counsel to the effect that such appointment has been duly made, that the person so appointed has faithfully performed the duties imposed upon him, and that the number of days stated in such voucher have been consumed in conducting such litigation and in preparation therefor. "Witnesses; incriminating testimony; penalty; perjury. Section 94-34. No person shall be excused from testifying in such proceeding, or in any proceeding for violation of or growing out of the provisions of this act, on the ground that his testimony may expose him to prosecution for any crime, misdemeanor or forfeiture. But no person shall be prosecuted, or subjected to any penalty or forfeiture, except forfeiture of nomination or of election to office, for or on account of any transaction, matter, or thing concerning which he may testify or produce evidence, documentary or otherwise, in such proceeding or examination, except a prosecution for perjury committed in giving such testimony. "Expense accounts; failure to file: notification. Section 94-35. The officer with whom the expense account of any candidate for public office is required by any law of this state to be filed, shall notify such candidate of his failure to comply with such law, immediately upon the expiration of the time fixed by any law of this state for the filing of the same, and shall notify the district attorney of the county where such candidate resides of the fact of his failure to file, and said district attorney shall thereupon prosecute such candidate. "Criminal actions; judgment. Section 94-36. 1. If any person shall, in a criminal action, be judged to have been guilty of any violation of this act, while a candidate for any office under the constitution or laws of this state, or under any ordinance of any town or municipality therein other than the office of state senator or member of the assembly, the court shall, after entering the adjudication of guilty, enter a supplemental judgment declaring such person to have forfeited the office in the conduct of the campaign for the nomination or election to which he was guilty of such violation, and shall transmit to the filing officer of such candidate a transcript of such supplemental judgment, and thereupon such office shall be deemed vacant and shall be filled as provided by law. "Personal campaign committee; violation; judgment. 2. If any person shall, in a similar action, be found guilty of any violation of this act, committed while he was a member of the personal campaign committee of any candidate for any such office, the court before which such action is tried, shall immediately after entering such adjudication of guilty, enter a supplemental judgment declaring such candidate to have forfeited the office in the conduct of the campaign for nomination, or election, to which such member of his personal campaign committee was guilty of such violation, and shall transmit to the filing officer of such candidate a transcript of such supplemental judgment, and thereupon such office shall be deemed vacant and shall be filled as provided by law. "Congressional and legislative candidates; judgment. 3. If any person shall, in a criminal action, be adjudicated guilty of any violation of this act, committed while he was a candidate for the office of state senator, member of the assembly, United States senator or representative in congress, or while he was a member of the personal campaign committee of any such candidate, the court, after entering such adjudication of guilty, shall forthwith transmit to the presiding officer of the legislative body as a member of which such officer was a candidate when such violation occurred, a certificate setting forth such adjudication of guilty. "Criminal court; jurisdiction. 4. Any court having jurisdiction to enter judgment of guilty in any such criminal action is hereby vested with jurisdiction to enter such supplemental judgment, transmit a transcript thereof and issue a certificate as provided in this section. "Employment of counsel by candidate. Section 94-37. Nothing contained in this act shall prevent any candidate from employing counsel to represent him in any action or proceeding, affecting his rights as a candidate, nor from paying all costs and disbursements necessarily incident thereto. No sum so paid or incurred shall be deemed a part of the campaign expenses of any such candidate. "Penalty. Section 94-38. Any person violating any provision of sections 94-1 to 94-38, inclusive, of the statutes, shall upon conviction thereof, be punished by imprisonment in the county jail for a period of not less than one month nor more than one year, or by imprisonment in the state prison for a period of not less than one year nor more than three years, or by a fine of not less than twenty-five dollars nor more than one thousand dollars, or by both such fine and imprisonment; and no person so convicted shall be permitted to take or hold the office to which he was elected, if any, or receive the emoluments thereof. "Appropriation. Section 94-39. A sum sufficient to carry out the provisions of sections 94-1 to 94-39, inclusive, of the statutes, not to exceed the sum of fifteen thousand dollars is appropriated annually out of any money in the treasury not otherwise appropriated." "Newspapers and periodicals; paid advertisements. Section 94-14. 1. No publisher of a newspaper or other periodical shall insert, either in the advertising column of such newspaper or periodical or elsewhere therein, any matter paid for or to be paid for which is intended or tends to influence, directly or indirectly, any voting at any election or primary, unless at the head of said matter is printed in pica capital letters the words 'Paid Advertisement,' and unless there is also a statement at the head of said matter of the amount paid or to be paid therefor, the name and address of the candidate in whose behalf the matter is inserted, and of any other person, if any, authorizing the publication, and the name of the author thereof. "Persons financially interested in; statement. 2. Every person occupying any office or position under the constitution or laws of this state, or under any ordinance of any town or municipality herein, or under the constitution or laws of the United States, the annual income of which shall exceed three hundred dollars, and every candidate, every member of any personal campaign or party committee, who shall either in his own name, or in the name of any other person, own any financial interest in any newspaper or periodical, circulating in part or in whole in Wisconsin, shall, before such newspaper or periodical shall print any matter otherwise than as is provided in subsection I hereof, which is intended or tends to influence, directly or indirectly, any voting at any election or primary in this state, file in the office of the county clerk of the county in which he resides a verified declaration, stating definitely the newspaper or periodical in which or over which he has such financial interest or control, and the exact nature and extent of such interest or control. The editor, manager, or other person controlling the publication of any such newspaper or article, who shall print or cause to be printed any such matter contrary to the provisions of this act, prior to the filing of such verified declaration from every person required by this subsection to file such declaration, shall be deemed guilty of a violation hereof. "Newspaper disbursements prohibited. Section 94-15. No owner, publisher, editor, reporter, agent or employee of any newspaper or other periodical, shall, directly or indirectly, solicit, receive or accept any payment, promise or compensation, nor shall any person pay or promise to pay, or in any manner compensate any such owner, publisher, editor, reporter, agent, or employee, directly or indirectly, for influencing or attempting to influence through any printed matter in such newspaper any voting at any election or primary through any means whatsoever, except through the matter inserted in such newspaper or periodical as 'paid advertisement,' and so designated as provided by law." Statute law must fit economic conditions as Blackstone says "like the clothes on the body." It was feared by those who constructed the Wisconsin initiative and referendum resolution (jt. res. no. 74, laws of 1911) that if the Oregon plan was adopted, crude legislation, which would receive harsh criticism from the courts, would result. Bills, good in concept, but poor in technique, would result, it was thought, from the drafting of bills by groups in different parts of the state. Under the Oregon law these bills would have to be rejected or incorporated into the statutes without the change of a word or the dotting of an i. Bills submitted to the people should be so worded that a yes or no on the part of the voter is all that is necessary. It was felt that under any other system the voter might have to answer a question like that put to the man who insisted that a public speaker answers questions asked him by a yes or no. The speaker asked him in return, "When did you beat your wife last? Answer yes or no." Time after time it has been found in the drafting of Wisconsin's strongest laws, that they were somewhat modified under the fire of criticisms made by attorneys and experts appearing before the legislative committees. With sufficient expert help for the legislature there is little to fear and much to gain from strong, clear argument presented by the opponents of a bill. The committee may say frankly that some kind of legislation embodying a certain idea is going to be reported and if the opponents wish it to be sane and workable they will give their best help by reasonable criticism. If they object to a certain actuarial computation made by the statistical experts, the committee, upon being convinced, will correct it. The Wisconsin railroad commission bill, for instance, was completely redrafted twenty different times. The Wisconsin leaders, desiring to retain the advantages gained by subjection of bills to severe criticism, provided that any bill, which has been introduced into the legislature within the first thirty days of the session, whether it has passed the legislature or not, may be called out by petition and submitted to the people at the next election. "A proposed law shall be recited in full in the petition, and shall consist of a bill which has been introduced in the legislature during the first thirty legislative days of the session, as so introduced; or, at the option of the petitioners, there may be incorporated in said bill any amendment or amendments introduced in the legislature. Such bill and amendments shall be referred to by number in the petition. Upon petition filed not later than four months before the next general election, such proposed law shall be submitted to a vote of the people, and shall become a law if it is approved by a majority of the electors voting thereon, and shall take effect and be in force from and after thirty days after the election at which it is approved." The same general procedure is applied to constitutional amendments, save that 10 per cent is required for an initiated constitutional amendment which has not passed the legislature and 5 per cent for a constitutional amendment which has passed one session of the legislature; whereas 8 per cent is required for either the initiative or the referendum on ordinary bills. "An emergency law shall be any law declared by the legislature to be necessary for any immediate purpose by a two-thirds vote of the members of each house voting thereon, entered on their journals by the yeas and nays. No law making any appropriation for maintaining the state government or maintaining or aiding any public institution; not exceeding the next previous appropriation for the same purpose, shall be subject to rejection or repeal under this section. The increase in any such appropriation shall only take effect as in case of other laws, and such increase, or any part thereof, specified in the petition may be referred to a vote of the people upon petition." The criticism is made that the Wisconsin proposal is no initiative at all; that if the legislator does not wish to introduce the bill he will not do so. The first answer to this objection is that it would be an exceedingly poor bill whose author could not find, among a hundred and thirty-three legislators, one who would be willing to introduce it. Again, if a petition containing four or five thousand signatures or the number which is required under the Oregon petition demanding a bill is submitted, it is practically impossible to keep it out of the legislature. The petition may be used if necessary in getting some member to introduce the bill. No strength of the Oregon scheme is lost here. The orderly proceeding in the legislature is retained, and in addition there is an elasticity which is not found in the Oregon law. The petitioners who have secured a legislator willing to father the bill have at their command, through this legislator, the services of the legislative reference department, with its skilled draftsmen, who will aid them in the technical construction of the bill to be introduced. Nearly all initiative and referendum plans provide that the legislature may send a competing bill to the people, but the Wisconsin plan precludes the legislature sending anything to the people. The opinion is that the legislature should not be allowed to dodge its responsibility but should be made to state its preference by aye or no. It should not be permitted to confuse the situation by sending one or more competing bills to the people. This clears the decks and makes the issue clean cut. Suppose that a strong bill comes before the legislature and that body passes some weak substitute for it; under this plan the people can do one of two things: they can call for a referendum on this weak plan and kill it or they can call out some other and better bill, with whatever strengthening amendments the petitioners may desire, and pass this bill, thus repealing the first bill by superseding it. In any case the legislature cannot dodge the situation; it must meet its obligations--and the roll call before the public. After all, it is not unlike the process by which the legislature delegates to committees the power to consider bills and to recommend them. The legislature should be a convenience, a committee of the whole people. If it does not fulfill the will of the whole people for some particular reason, the people should have a right to assert their will. If a committee of the legislature does not do what the legislature desires, it overturns the reports of the committee on the floor of the house, modifies it or does whatever it pleases with it, so under this resolution, the people will allow the legislature to act upon the measures as a matter of convenience. If the legislature passes something which the people do not want, they will overturn that measure if they so desire, or if the legislature fails to pass something which the people do want, they can remove it from the hands of the legislature and refuse to accept the report of the legislature upon the matter. We have in this joint resolution a new principle applied to the initiative and referendum. It does not contain the "direct drive" or "direct legislation" proposition of the Oregon law, but it does contain that which is fully as strong and which has some essential features making the whole proposition more harmonious. It is a strong aid to representative government and at the same time a vigorous method of directly expressing the popular will. An organization which puts a bill before the legislature can take it out just as it was put in, but it must give a public hearing for so many months to all parties interested. Naturally if a part of the legislature is defeated on some big proposition that portion will say to the rest, "We will go out to the people and ask the people's support upon this matter and they will decide between us." The initiative and referendum plan herein described has yet to pass the 1913 legislature and be accepted by the people before it becomes a part of the Wisconsin constitution. There has been such a demand for copies of this resolution that it is presented in full in the Appendix. The recall resolution is very simple and does not include the judges. The legislature and the people in general are so well satisfied with the Wisconsin supreme court that the legislature almost unanimously opposed the insertion of the recall of judges into its resolution. The recall will receive further consideration in a later chapter dealing with the judiciary. "Section 12. The legislature shall provide for the removal by recall from office, by the qualified electors of the electoral district in which any officer is elected, of every public officer in the state of Wisconsin holding an elective office, except judicial officers." The laws described in this chapter are the principal ones relating to reform in direct legislation and electoral machinery. Space forbids the description of important laws relating to registration in cities and the betterment of electoral conditions in general. Wisconsin does not require the senatorial pledge nor any form of statement from legislators intended to insure the direct election of United States senators such as has been used in Oregon. It was defeated at the 1911 session of the legislature by a narrow margin because of what was apparently an unexpected return to party lines. It undoubtedly will be considered later as there seems to be a strong sentiment in favor of it. Wisconsin has not the real Australian ballot, that is, the ballot without the circle which has been used for a long time in Massachusetts and Minnesota and now is being very gradually adopted in other states. It was often recommended by Governor La Follette and at one time was defeated by a 40 to 40 vote. The Social-Democratic party, which is represented by fourteen members in the legislature, are greatly opposed to this form of ballot. This organization believes in working strictly through party lines, in making a program and remaining true to it regardless of individuals. To remove the circle from the ballot would be striking at the very fundamentals of this party. The tide has always been turned against an Australian ballot bill by the Socialist vote and proposed bills for non-partisan elections in cities have suffered like defeat. A fierce struggle for the enactment of this last named measure is already presaged for the 1913 legislature. The electoral machinery is not perfect, but the above is a brief statement of its underlying principles and of what has been accomplished thus far for its improvement.